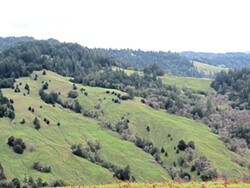 Little green firs eating up open land in Southern Humboldt. Length isn't everything. The Douglas fir (Pseudotsuga menziesii) grows fast, quickly outsizing stands of Oregon white oak (Quercus garryana), California black oak (Quercus kelloggii) and Canyon live oak (Quercus chrysolepis). But although they may be taller, these feral Christmas trees are relative infants next to their Querci neighbors, which reach a peak size of between 70 and 90 feet and often live for 400 years or more. Now these supercentenarians, which cover an estimated 138,132 acres across Humboldt County, are at risk of being outshaded and annihilated by the upstart firs. To the rescue? An unlikely coalition of ranchers, environmentalists and dentist-turned-Assemblyman Jim Wood. "There's just a recognition from both sides of the political spectrum that what we're doing wasn't working and we're losing this precious resource," Wood said in a phone interview. This year the assemblyman introduced Assembly Bill 1958, which passed the Natural Resources Committee on April 6 and is currently before the Appropriations Committee. Wood said he had been contacted by many constituents concerned about the disappearance of oak woodlands. The bill was sponsored by two local conservation groups: the Northcoast Regional Land Trust and The Buckeye Conservancy. Dan Ehresman, project manager for the land trust, said the issue of conifer encroachment had been "on the radar" for more than a decade. 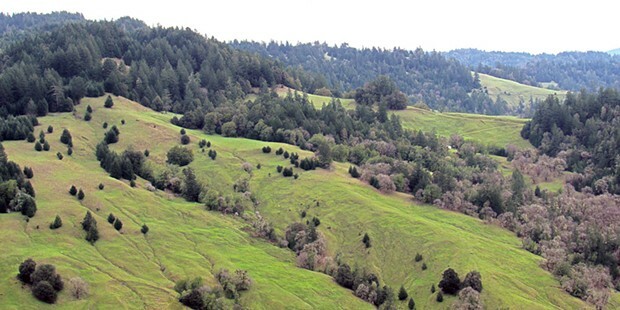 In a report prepared in November of 2011, the group described native oak woodlands as an important part of the aesthetic, environmental, economic and cultural landscape of Humboldt County. Besides providing habitat and food for a number of species, the trees are also more likely to withstand fires. "There's a major tie-in with climate change and fire resilience," said Ehresman, who described the smaller, pitch-laden firs as "match sticks." The fir stands significantly increase fuel loads during wildfire season. They're also thirsty plants, sucking water from the soil in the summer. The peaty soil beneath oak stands makes the perfect bed for fir seedlings, while oak acorns germinate slowly and with less frequency. 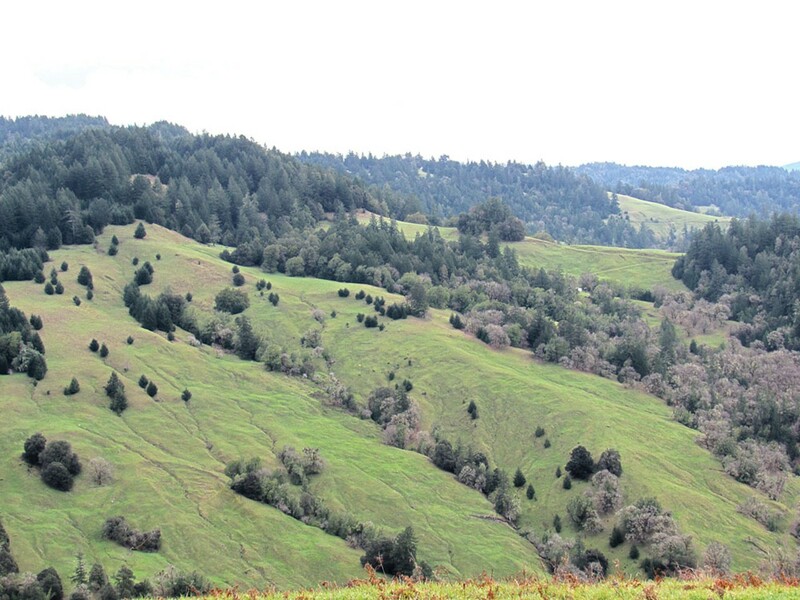 Yana Valachovic, forest advisor at the local University of California Cooperative Extension, said there isn't an oak stand remaining in Humboldt County that hasn't been impacted to some extent by the march of the conifers. Valachovic, who served in an advisory capacity to the bills' authors, said that historic conservation efforts have been sadly conifer-centric, with more attention paid to redwoods than their humble inland cousins. But, of course, the genuses have co-existed for thousands of years, so why has strangulation of these slow-growing giants only become a problem in our lifetime? The answer, Ehresman and others say, is fire. Land management by fire was often practiced in the region by Native Americans, who relied on acorns as part of their diet and used the prairies that surround oaks as hunting grounds. Seasonal wildfires also swept through the region, killing fir seedlings before they could grow but leaving the hardier oaks to continue. This method of land management was also taken up by white settlers, who wanted to preserve the prairies as grazing land for cattle. "In the late fall, we'd run slow burns up under the oak canopies," said Duane Frederickson, a Buckeye member whose family has operated a ranch near Kneeland since the mid-1800s. "It would control the unwanted species that would overtake the oaks. In the last 50 years, a number of factors kept us from continuing it." Frederickson listed stricter air quality control and environmental regulations among those factors. The widespread dissolution of many family ranches, subdivided and largely converted to marijuana grows, has also contributed to management challenges, according to Lauren Sizemore, executive director of the Buckeye. 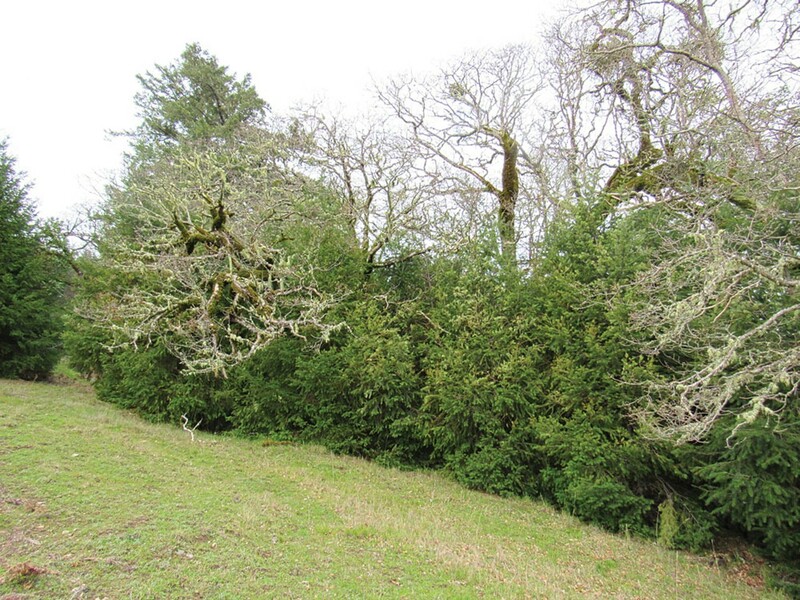 In 2006, Frederickson undertook a personal oak woodlands management plan, removing encroaching Douglas fir by hand on his ranch. He used 100-year-old photos as a frame of reference for what a natural landscape would look like. It was labor-intensive, he said, but rewarding. He watched native grasses and other species return. Others followed his lead. The initiative became a rare space of common ground between ranchers, loggers and environmentalists. "I'm very pleased to see this catching on," Frederickson said. He has led tours of his land for the Environmental Protection Agency, California Department of Fish and Wildlife and others. "We've made great inroads partnering with these groups and getting them out on the ground to see what we have to work with." The next step, he and others believe, would be a return to prescribed burning, but for many stands this option comes too late. "It's not the great panacea," he said, adding that the fuel load beneath the stands is too great at this point and the oaks would burn. "Some of it's still going to have to be mechanically removed." "Mechanically removing" firs may mean plucking them out by hand when they're very small or, if they're larger, using a chainsaw and a crew. But landowners cannot sell the fir for commercial profit without filing a timber harvest plan, which often costs tens of thousands of dollars. Douglas fir generally offers a poor return on investment in terms of commercial value. Also, under the Forest Practices Act, every conifer removed as part of a commercial harvest would require an additional conifer to be planted, a regulation all agree defeats the purpose of restoration. The Board of Forestry is considering revising these guidelines. Valachovic said that some large scale commercial fir harvests may still require timber harvest plans, but should AB 1958 go through, most landowners would be freed up to saw down the pesky firs without that level of financial and regulatory burden, under what's known as an exemption. Mike Miles, a forester and board member with the NRLT, said his organization has insisted for a long time that removing Douglas firs from oak woodlands is a solid land management practice. According to Miles, who also works for the Humboldt Redwood Company and sits on the Board of Forestry, the land trust initially tried to write a joint policy with CALfire to untie landowners' hands. CALfire said the legislation around the issue was too "gray" to amend via that process. So the land trust set its sights on creating legislation that would make the issue crystal clear. Trust officials were considering politicians to approach when Wood's office reached out to them, asking if there were any Humboldt-specific environmental projects that could use support in Sacramento. The original conversation involved a three-pronged approach to the issue: Clarify that treating oak woodlands is not "converting" land (like making a meadow out of a forest) but rather restoring it; create an exemption for oak woodlands so landowners can make a profit; and re-introduce prescriptive burning. Wood approached CALfire to see if the agency would support the legislation and it agreed ... to a point. Prescribed burning is not included in AB 1958. Although there seems to be widespread support for the bill and for oak woodlands preservation in general, both Wood and Miles admit there is wariness among some environmental groups. Many small landowners feel current regulations are too "one size fits all," and have taxed stewardship efforts. But additional legislation perceived as diluting the Forest Practices Act will undoubtedly raise some eyebrows. "There's an idea that we're governing by exemption," said Wood, adding that it may be time to revisit laws around timber harvest plans. "I'm sensitive to that, but on the other hand, maybe we need to go back and if see is this having the results we're intending."